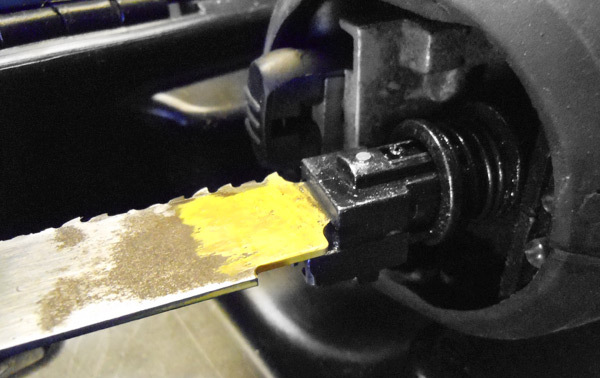 After six years of use and abuse, our Worx Revovler recip saw has managed to grow a rather unheathly attachment to its blade. We were cutting railroad ties in half at a friend’s place when we noticed it just wasn’t getting through them any more and it was time to change the blade. The normal process of pushing the button and releasing the blade didn’t work, either: it was stuck. After pushing, pulling, prying, shaking, and cursing, we still couldn’t get it to budge. We’re not sure how it’s stuck in there, but damned if we can mechanically move it. Our next steps are going to be drastic — heat and most likely disassembly. We love the saw, but right now this issue has rendered it a fantastic paperweight. The instructions have no section for troubleshooting or what you’re supposed to do about a jammed-up blade, which I personally find very annoying. I’m not afraid of taking things into my own hands, but a set of guidelines would be nice. Have you run into this issue with a recip? Let us know what you had to go through to repair the rig. WD40 and a few well placed taps? Wow that saw looks strangely familiar to the new dewalt compact reciprocating saw. WORX seems to be a synonym for “cheesy.” A neighbor got a WORX string trimmer. The work the trimmer does is miniscule compared to the work involved in keeping the thing working properly. Parts that don’t fit quite right, uncontrolled start/stop (shaking the thing sometimes gets it to go again but never for very long. Hopefully some folks have had better luck with this POS than the neighbor! Then again, he is quite fond of most anything in a late night infomercial. I don’t have any experience with this saw, but I have had the experience of having contamination from grit, etc. in the work environment making it difficult to free a blade from my reciprocating saw chuck. If you were cutting creosote treated ties, I wonder of some of the creosote made its way into the chuck as the blade labored and heated up. If that were the case, the application of solvents and/or mild heat to the chuck might help. I have to say, though, the blade in the photo looks pretty clean to have been cutting creosote ties.